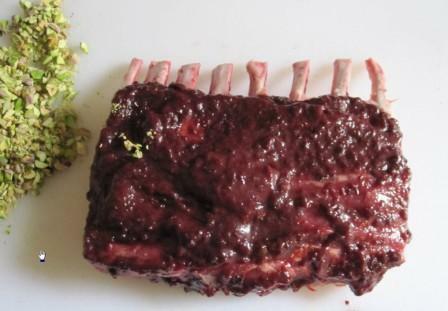 I can’t take credit for this recipe, it was sent to me by one of our fellow passionate wine and food lovers, Ken K. He did an incredible job in documenting the whole process of preparation! It sounds and look really good, I have yet to try it.I thought this would be an excellent recipe for the last week of 2010. The entertaining comments are also Ken’s work, so I left it as it was sent to me. Enjoy! 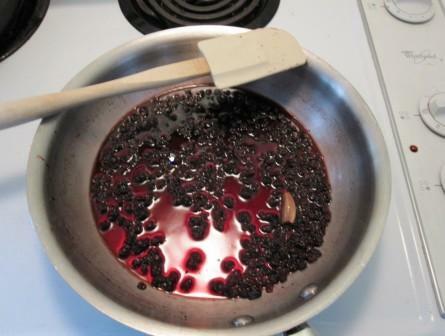 Boil pomegranate juice, currants, and garlic in medium skillet until liquid is syrupy and mixture is reduced to 1/4 cup, stirring often, about 10 minutes. Transfer mixture to mini processor. Add butter, cinnamon, and cumin and blend until coarse puree forms. Place processor bowl in freezer 10 minutes to firm butter slightly. Line small rimmed baking sheet with foil. Place lamb, bone side down, on sheet. Sprinkle with salt and pepper. Spread pomegranate butter over; sprinkle pistachios and panko over, pressing to adhere. 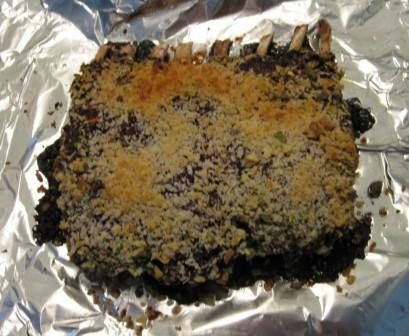 Roast rack of lamb until instant-read thermometer inserted into side registers 135°F for medium-rare, about 30 minutes. Transfer to work surface and let rest 10 minutes. 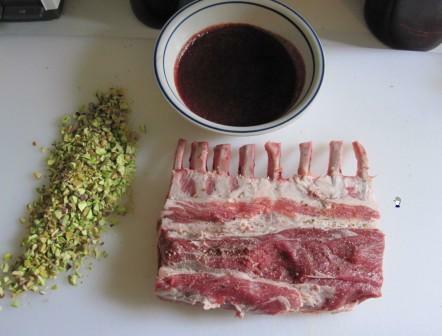 Cut lamb between bones. Drizzle with any juices from foil. Ready to do some reducing……………………………. 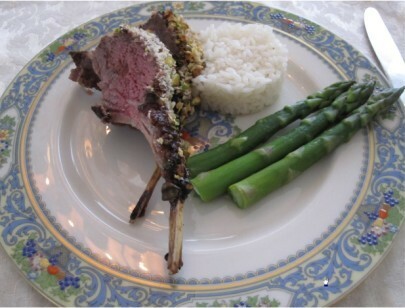 The spatula is waiting….I am chopping and trimming the lamb. 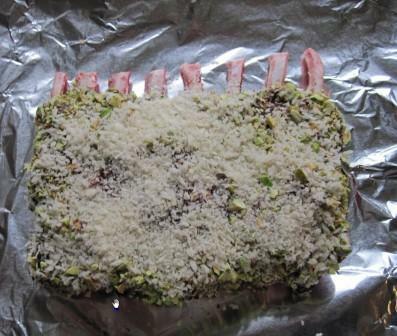 Sauce is chilled, pistachio’s chopped, lamb salt and peppered……….. 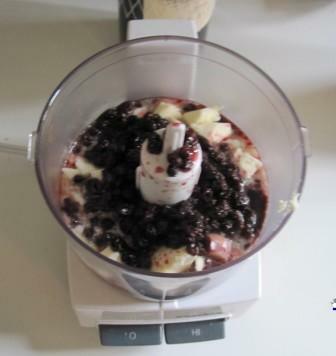 Baked – ready for a 10 minute rest………………………..
OK, finally a recipe for a big, fruity red! I would suggest Châteauneuf-du-Pape (the nice one is made by Chateau La Nerthe or Eric Texier) or a cheaper version Cotes du Rhone Domaine de la Solitude Cotes du Rhone. 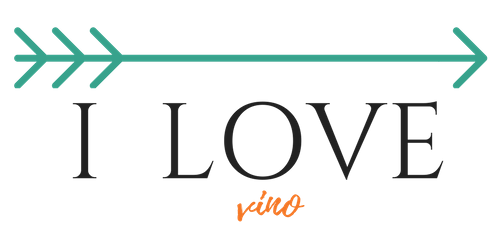 These wines have enough body and rich fruitiness to pair well with the fruit of the marinade, rich flavors of lamb and the spices. Any old vines Garnacha from Spain would work great too! For example Atteca, Garnacha de Fuego or Juan Gil Monastrel from Jumilla. Rich Australian Shiraz or red blend would be an excellent choice, such as Peter Lehmann’s Clancy or his Shiraz. This recipe is the wine pairing ultimate heaven! Italian Brunello, fruity Zinfandel, Californian Syrah – all the rich, big wines that I feel there is never the right time, would work with this impressive dish! Your favorite Cabernet Sauvignon? Absolutely! Let me know what did you pair it with!!! Next postWe have winners of our Vera Wine Club’s Holiday Giveaway!